Ethchlorvynol is a sedative and hypnotic drug. This medicine has been used to treat insomnia, but has been largely superseded and is only indicated where an intolerance or allergy to other drugs exists. 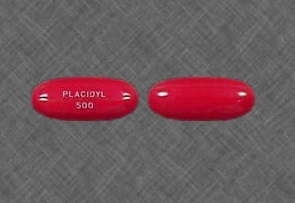 What is placidyl used for? What are Brand and street names for ethchlorvynol? Brand names for ethchlorvynol are: Arvynol, ECV, Ethylchlorovinyl, Placidyl, Serensil. 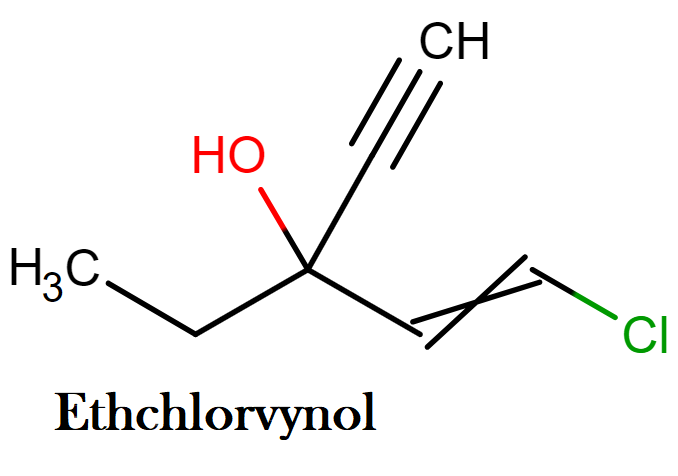 The most common street names for ethchlorvynol is Green Weenies. This compound belongs to the class of organic compounds known as ynones. These are organic compounds containing the ynone functional group, an alpha,beta unsaturated ketone group with the general structure RC#C-C(=O)R’ (R’ not H). Ethchlorvynol is Schedule IV in the U.S. This means it is illegal to sell without a license and illegal to possess without a valid license or prescription. Similar to other older sedative-hypnotic drugs (e.g., methaqualone, meprobamate, glutethimide), ethchlorvynol was introduced as a safer, nonaddictive substitute for barbiturates during the 1950s. However, the abuse potential and toxicity of these sedatives were well recognized during the 1960s and 1970s. During the late 1970s, Drug Abuse Warning Network (DAWN) data indicated that ethchlorvynol use was associated with over 300 deaths yearly. Although the exact mechanism of action is unknown, ethchlorvynol appears to depress the central nervous system in a manner similar to that of barbiturates. Barbiturates bind at distinct binding sites associated with a Cl– ionopore at the GABAA receptor, increasing the duration of time for which the Cl– ionopore is open. The post-synaptic inhibitory effect of GABA in the thalamus is, therefore, prolonged. Absorption. Following the ingestion of therapeutic doses of ethchlorvynol, gastrointestinal (GI) absorption is rapid with peak serum ethchlorvynol concentrations occurring about 1 – 1.5 hours after ingestion. In a small study of healthy volunteers, the peak serum ethchlorvynol concentration occurred about 1 hour after the ingestion of 500 mg and 750 mg. The ingestion of fatty foods delays ethchlorvynol absorption. Distribution. The initial distribution half-life of ethchlorvynol after therapeutic doses is about 1-3 hours with a relatively large volume of distribution (i.e., 4 L/kg). This highly lipophilic drug distributes widely into fatty tissues. The sedative effects disappear in 3-5 hours as ethchlorvynol distributes into peripheral tissues. A rebound increase in serum ethchlorvynol concentrations can develop 7-10 hours after ingestion as a result of the redistribution of ethchlorvynol from peripheral stores. Ethchlorvynol is approximately 50-60% protein bound. Metabolism. The liver probably is the primary site of ethchlorvynol metabolism; however, the exact pathway of ethchlorvynol metabolism remains poorly defined. A potential metabolite includes 1-chloro-3-ethynylpent-1-en-3,4- iol from the hydroxylation of C4. Excretion. The kidney excretes small amounts (< 0.1%) of a therapeutic ethchlorvynol dose unchanged in the urine. The initial serum elimination half-life of ethchlorvynol after a therapeutic dose is relatively rapid (i.e., about 6 – 8 hours), but a slow β-elimination phase results from a biphasic elimination pattern and the delayed release of ethchlorvynol from tissue stores. During acute ethchlorvynol intoxication, the serum elimination half-life may increase substantially (20-100 hours). The serum elimination half-life of ethchlorvynol in an obese, hypothyroid man chronically using ethchlorvynol was 78 hours with a total body clearance of 9.92 mL/min. Renal clearance of ethchlorvynol is relatively small. Insomnia is the main medical condition treated by this drug, although it has also been used as a tranquilizer. The compound has been used to assist pain relief, on the theory that its calming and sleep-inducing qualities can allow pain relievers to work better. Although ethchlorvynol is considered safe for adults under medical supervision, ordinarily medical personnel are not supposed to dose children with ethchlorvynol, as adequate testing of impact on juveniles has not been done. Normally the drug is not supposed to be used for more than one week, as longer dosage increases risk of adverse effects. Because the drug makes people sleepy, they should avoid running dangerous machinery (such as motor vehicles) while under the influence. Symptoms of ethchlorvynol intoxication are similar to those of alcohol intoxication. The drug can cause nausea and vomiting, dizziness, and fainting. Confusion, stammering, intense headache, and general loss of vigor have also been reported. Intravenous abuse of the drug has caused vomiting, low blood pressure and body temperature, liver damage, fluid buildup in the lungs, and coma. Persons suffering from porphyria should avoid ethchlorvynol. Porphyria is a body chemistry disease that can cause sudden violent outbursts, and the disease can be promoted by ethchlorvynol. The substance should also be avoided by people who experience “paradoxical reactions” to barbiturates or alcohol. A paradoxical reaction is an effect opposite from the expected one-for example, barbiturates causing hyperactivity rather than mellowness. In an ethchlorvynol unusual accident the drug squirted into someone’s eyes and seriously injured the corneas. The typical adult dose of ethchlorvynol is 500-750 mg. Mild to moderate ethchlorvynol intoxication begins with ingestions in the 4-10 g range. 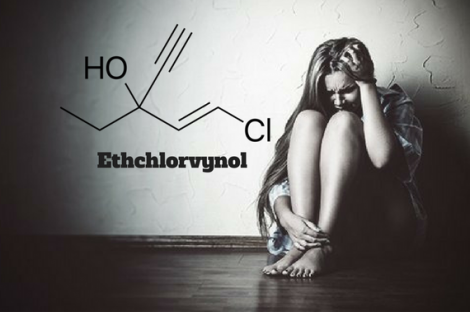 The response to ethchlorvynol is variable depending on a number of factors including tolerance and the concomitant ingestion of other central nervous system (CNS) depressants. The ingestion of 30-50 g ethchlorvynol was associated with prolonged coma, respiratory insufficiency, and hypotension. Case reports associated survival after intensive supportive care and prolonged coma following the estimated ingestion of 80-125 g ethchlorvynol. The clinical features of chronic ethchlorvynol abuse are similar to chronic ethanol abuse. Symptoms associated with chronic abuse of ethchlorvynol include ataxia, dysarthria, diplopia, blurred vision, generalized weakness, tremor, toxic amblyopia, and central scotomata. Clinical effects begin within 15-30 minutes. Although ethchlorvynol abuse typically involves the excessive ingestion of prescription drugs, occasionally drug abusers inject the liquid capsular contents of ethchlorvynol capsules. Alcohol abusers may find ethchlorvynol attractive. Medical authorities have noted close similarities between symptoms of dependence and withdrawal evoked by alcohol and ethchlorvynol. A case report indicates that tolerance may develop, but the indication was complicated by influence from the patient’s thyroid disease. Another case report tells of the opposite effect, with a person becoming so sensitive to the drug that a trivial dose put him into a coma for a week. Experts generally feel, however, that tolerance is a more typical development. The drug has a withdrawal syndrome that may not start until days after dosage suddenly stops. Withdrawal may include the dependence symptoms just noted, plus excitability, convulsions, delirium, hallucinations, nervousness, and loss of normal emotional reactions. Delirium tremens can also occur. Clinical features of withdrawal begin from 3-15 days after cessation of use. Symptoms usually resolve in 3-8 days, but occasionally symptoms may persist longer. Case reports associate the development ethchlorvynol was approximately 6.5 mg/L and 8 mg/L, respectively. Standard treatment involves temporary reinstatement of the drug followed by tapering off doses, but phenobarbital has enough cross-tolerance to substitute for this purpose. Typically such detoxification is delicate enough to require hospitalization. The clinical features of mild ethchlorvynol overdose are similar to sedative – hypnotic drug overdose with symptoms ranging from slurred speech, ataxia, and nystagmus to lethargy. In addition, a relative bradycardia and excessive salivation often occurs following ethchlorvynol overdose. Symptoms of intoxication also include a mint – like taste, dry cough, and pungent odor on the breath. Severe ethchlorvynol intoxication produces a prolonged deep coma, hypothermia, respiratory depression, bullae, and hypotension. Serious complications of ethchlorvynol intoxication include aspiration pneumonia, respiratory arrest, and pulmonary edema. Although pulmonary edema occurs more commonly after the injection of ethchlorvynol capsules, occasional case reports associated large ethchlorvynol overdose with the development of noncardiogenic pulmonary edema 24-48 hours after ingestion. Prolonged coma during ethchlorvynol intoxication may cause an ischemia – induced peripheral neuropathy. The presence of a pink gastric aspirate with prolonged coma, hypotension, and a relative bradycardia suggests ethchlorvynol poisoning. As for all sedative – hypnotic overdoses, stabilization requires careful evaluation of the level of consciousness and the adequacy of respirations. Seizures may occur during withdrawal from ethchlorvynol along with restlessness, agitation, and delirium. All patients with altered levels of consciousness should be evaluated rapidly for serum glucose concentrations and hypoxemia. The administration of activated charcoal is appropriate for patients with ethchlorvynol overdose presenting < 1 hour after ingestion. However, most patients present to a health care facility > 1 hour after ethchlorvynol ingestion, and gut decontamination measures are not necessary as a result of the lack of clinical data to support the use of aggressive decontamination measures in these patients. Theoretically, the administration of activated charcoal more than 1-2 hours after ingestion may decrease ethchlorvynol absorption in comatose patients with decreased gastrointestinal motility, but there are inadequate data to indicate that the administration of activated charcoal at this time improves clinical outcome. Gastric lavage in comatose patients is a therapeutic option, particularly with delayed gastric emptying. However, there are few data on the efficacy of gastric lavage in ethchlorvynol overdose. Syrup of ipecac is not recommended because of the lack of efficacy and the potential for aspiration. The renal clearance of ethchlorvynol during resin hemoperfusion for ethchlorvynol intoxication is high (140-170 mL/min), but there are few data on the effect of resin hemoperfusion on the clinical outcome of ethchlorvynol intoxication. Substantial rebound of ethchlorvynol from peripheral stores may signifi cantly increase the serum ethchlorvynol concentrations within 6-8 hours after treatment. Factors to consider for the use of resin hemoperfusion include failure to respond to supportive measures, life – threatening complications associated with prolonged coma, and serum ethchlorvynol concentrations that exceed 150 mg/L. Although hemodialysis reduces the plasma ethchlorvynol half – life, the effect of hemodialysis on the clinical outcome of ethchlorvynol intoxication is unclear, in part because of relatively high protein binding and the large redistribution from tissue to blood. Three hours of hemodialysis removed 3 g (i.e., about 3-5% of the total dose) of an estimated 80-125 g ingestion of ethchlorvynol. The estimated clearance of ethchlorvynol during hemodialysis for 2 patients with ethchlorvynol poisoning was 46 mL/min and 82 mL/min. Forced diuresis is contraindicated because of the limited excretion of ethchlorvynol and the tendency of ethchlorvynol intoxication to cause pulmonary edema. There is no antidote for ethchlorvynol poisoning. How long ethchlorvynol stays in the system? Can ethchlorvynol be detected on standard urine test? Yes, ethchlorvynol can be detected on standard urine test. It can be detected in urine for 2-7 days, in saliva for 1-10 days and in hair for up to 90 days. Individuals are not supposed to use ethchlorvynol along with other depressants (including alcohol and barbiturates) or with monoamine oxidase inhibitors (MAOIs, included in some antidepressants and other medication). Delirium has occurred in persons who take ethchlorvynol along with the tricyclic antidepressant amitriptyline hydrochloride, and caution is advised about taking other tricyclic antidepressants along with ethchlorvynol. Ethchlorvynol may interact with medications given to prevent blood clots. In animals injected with THC, the main active component of marijuana, ethchlorvynol becomes more potent than usual. The drug is associated with fetal and newborn death in rat experiments. In one experiment using the drug on pregnant rats, offspring appeared normal but behaved abnormally and showed body chemistry aberrations. Effects on human pregnancy are uncertain. The substance passes into a human fetus, and in dogs the fetal blood level reaches the same strength as the maternal level. A baby born to a woman using the drug showed withdrawal symptoms; in an infant these may include abnormal reflexes, nervousness, and peevishness. Standard advice is to avoid ethchlorvynol during pregnancy. Although the drug’s presence in milk of nursing mothers is unclear, the potential hazard of dosing infants through the milk makes nursing inadvisable.